I have a suggestion to offer; and I respectfully offer it in light of the fact that posterity will inherit this motion picture, and posterity will be talking about your "instant of decision" for a hundred years to come, and posterity is quite apt to be a little rough on you in any case for not having ordered that very first atom bomb to be dropped outside of Hiroshima with other bombs poised to follow, but praise God never to be used. This is my suggestion: that you yourself re-enact that historic moment of decision before the camera. Why not? Why shouldn't you be photographed saying exactly whatever you said? If I were in your difficult position I would insist on so doing. Unprecedented, yes - but so is the entire circumstance, including the unholy power of that monopoly weapon. I am taking the liberty of sending a copy of this letter to Mr. Mayer at M.G.M. in the sincere hope that he will invite you to play yourself in the retakes. Truman's reply to the actor can be seen below. Months later, when the movie was released to the general public, the part of President Truman was played by a different actor altogether: Art Baker. I appreciated very much your letter of December second and thank you for suggesting to Mr. Mayer of M.G.M. that I become a movie star. In the first place I haven't the talent to be a movie star and, in the second place, I am sure you will do the part creditably. The only objection to the film, as it was, was that it appeared to have been a snap judgment program. 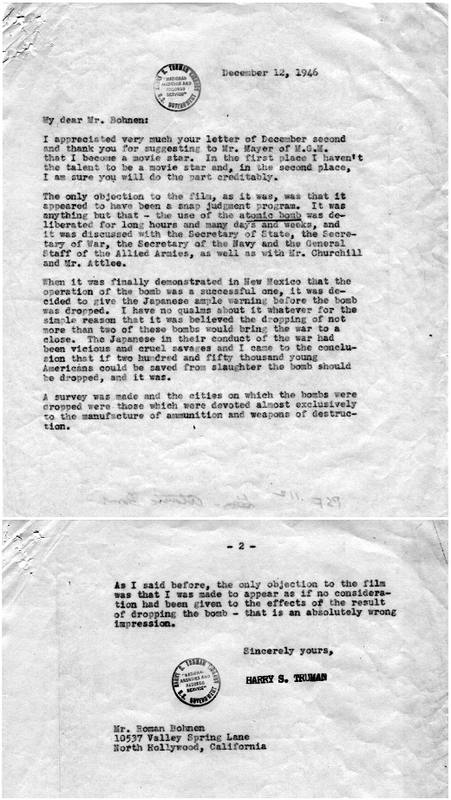 It was anything but that - the use of the atomic bomb was deliberated for long hours and many days and weeks, and it was discussed with the Secretary of State, The Secretary of War, the Secretary of the Navy and the General Staff of the Allied Armies, as well as with Mr. Churchill and Mr. Attlee. When it was finally demonstrated in New Mexico that the operation of the bomb was a successful one, it was decided to give the Japanese ample warning before the bomb was dropped. I have no qualms about it whatever for the simple reason that it was believed that the dropping of not more than two of these bombs would bring the war to a close. The Japanese in their conduct of the war had been vicious and cruel savages and I came to the conclusion that if two hundred and fifty thousand young Americans could be saved from slaughter the bomb should be dropped, and it was. As I said before, the only objection to the film was that I was made to appear as if no consideration had been given to the effects or result of dropping the bomb - and that is an absolutely wrong impression.